Prof. Dr. Walther Ch. Zimmerli, Dphil h.c. (University of Stellenbosch), born 1945, is Endowed Senior Professor of Mind and Technology at Humboldt University of Berlin and Associate Fellow at Collegium Helveticum (ETH Zürich). He studied at Yale College (Connecticut) and at the universities of Göttingen (Germany) and Zurich (Switzerland), where he completed his PhD in 1971 and his habilitation in 1978. 1971 – 1978 he was assistant professor in philosophy in Zurich. From 1978 on he held chairs at the universities of Braunschweig, Bamberg, Erlangen/Nürnberg and Marburg. From 1999 to 2002 he was the President of the private university of Witten/Herdecke GmbH. From 2002 to 2007 he was the Founding President of AutoUni and Member of the Topmanagement of the Volkswagen Group, from 2002 to 2006 additionally also member of the Executive Board of Volkswagen Coaching GmbH. 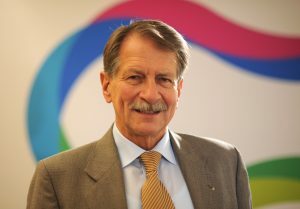 From 2007 to 2013 he was President of Brandenburg University of Technology. He also was visiting professor in the USA, Australia, Japan and South Africa. In 2002 he was awarded an honorary doctorate by the University of Stellenbosch. His further awards include the 1996 International Humboldt Research Award. He is board member of numerous organizations including the DAAD (German Academic Exchange Service).